This photo was taken on May 13, 2014 at 11:04 AM. The location was on the Beltway around the DC area - somewhere in Maryland. The "Take It!" came from the smile found in the fine print on the back of a grocery delivery truck. 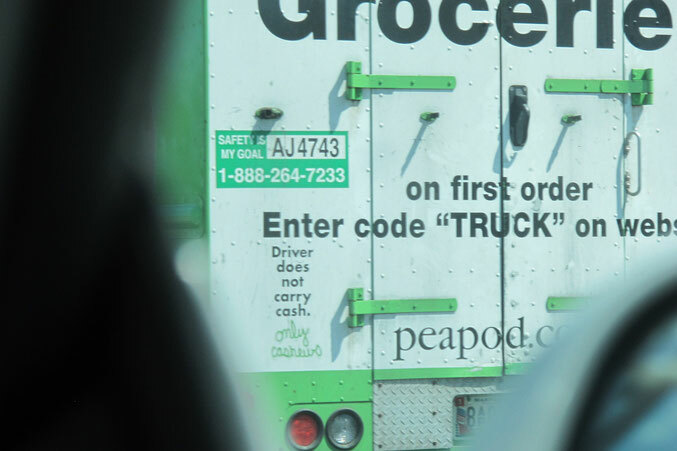 Even though this is a very big Grocery Chain - someone took the time to insert just a little bit of humor into what is a very common dry statement found on almost all trucks in the attempt to discourage what is sometimes called petty theft. The spotter was my co-driver for the day, who put on the speed and held us steady enough for me to take just one photo before the delivery truck took a hasty turn to make its way to an off ramp. Here is hoping something shows up to bring you a smile when you are caught up in heavy traffic. So I guess its a good thing you never see squirrels as armed robbers. this one is getting shared on twitter.